On Tuesdays, we each nachos. For lunch. With refried beans and zesty potato wedges. Top it off with a local apple and you’ve got yourself lunch at Academy School in Brattleboro! A few weeks back, I went to lunch with Jo Carol Ratti, principal of the Dummerston School for the past 20 years, who was keen to see what’s cookin’ in Brattleboro. So, we joined food service director, Ali West, for lunch at Academy School. You might wonder what fueled Jo Carol’s curiosity. In her final year at Dummerston, she has been part of a movement that’s beginning to take place. A group of passionate parents has come together to support the school in improving food quality and re-envisioning the school lunch menu. School meals are a complicated world of USDA regulations, tight budgets, and particular customers—so Jo Carol decided to visit Brattleboro for some inspiration. The Brattleboro Town School District has improved food quality over the past 5 years by adopting a set of higher food standards and recruiting a stellar food service director to oversee their implementation. Simply put, Ali West is a Rockstar (with a capital R) and is fully committed to serving good food to her students each and every day. She sources a variety of locally grown products and works hard to ensure the district’s higher food standards are met each week. Luckily, Ali was able to sneak out of the kitchen for a few minutes to eat lunch and share some wisdom with us. We joined a group of students at the “peanut free” table and set to polishing off our nachos and beans. Academy’s cafeteria is in a shared space with the gymnasium. Students flow through the kitchen to pick up the lunch they ordered earlier in the day and then head next door to grab fruit and a place to sit. Each day, Ali and her staff fill a big bowl with local apples for students to grab as a final addition to their lunch. 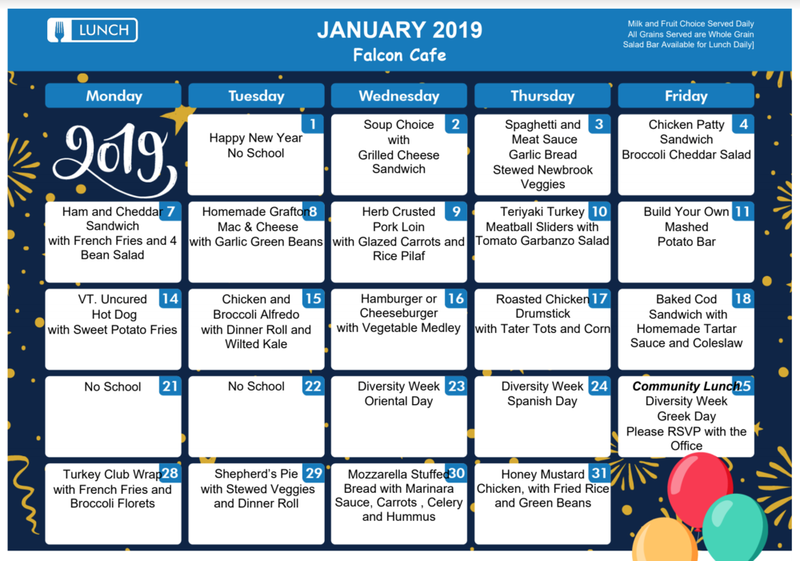 The menu for Brattleboro Town Schools is similar to other Cafe Services schools, with a few twists. Ali offers local apples and yogurt each day, as well as vegetarian options for students. Her March menu features vegan “Neatballs” and a BBQ tofu sandwich, to replace items featuring animal proteins. The district has eliminated a variety of unhealthy ingredients, including things like high fructose corn syrup, hydrogenated oils, and food dyes. Ali and her staff connect with Academy students during meal times and have found creative ways to increase participation in school meals. The lunch line is adorned with colorful VT Harvest of the Month posters as well as pictures featuring local farms. To top it all off, the kitchen door boasts its very own “farm to school” sign. All in all, a fulfilling experience. Until next time Academy! I arrived at Elm Hill elementary school in Springfield, VT early on Wednesday morning. Children and families were beginning to trickle inside, some headed to early morning recess and others headed to the cafeteria for breakfast. My mission? Learn more about the school’s efforts to increase food access by moving breakfast after the bell! Elm Hill hosts children from kindergarten through second grade, after which time they head across town to Union Street School for grades three through five. Elm Hill sits at what appears to be the top of Springfield, overlooking the city. The building is full of light and adorned with colorful student art. Principal Dr. Christine Pereira and her staff greet students with a warm welcome as they arrive for the day. This year, the school has implemented new strategies to support positive student behavior. Classrooms have adopted the practice of being “responsive,” working with students to create and uphold classroom expectations throughout the day. Another aspect of this new programming has been to increase the time period during which students can get breakfast in the morning. So, this school year, breakfast has been extended into the first part of the school day. Teachers may choose to send students to the cafeteria for breakfast or host the meal in the classroom as they give announcements and begin the day. In this way, teachers are able to make the new practice work for their classroom. Christine mentioned that while there was some initial hesitation based on previous challenges with breakfast after the bell, the school is now really embracing the new system. More students are participating in breakfast, and students are connecting with each other in new ways. My visit finished with a tour of the school, including the cafeteria, which was full of light, hanging plants, and happy students. The food program is managed by Anna Tewksbury, of Cafe Services, with two additional full-time staff supporting her. Kids selected from a variety of breakfast options—including scrambled eggs, muffins, fruit, orange juice, and milk. Many students were eating together at round tables, while others trekked back to the classroom with full trays. While we can’t necessarily attribute it to changes in breakfast programming, student behavior has generally improved this school year. It’s likely that increased access to breakfast has contributed to that in some way. Elm Hill staff has been proactive in their efforts to support student success and their efforts are paying off. On my way out of town, I happened to run into a few Elm Hill parents at a coffee shop and we got to talking about school breakfast. They expressed support and gratitude for the extended breakfast period this school year, noting that it “feels much more inclusive!” This program helps to relieve the stress that busy parents feel in the morning and promotes community building within the school. In Springfield, food service has embraced these changes and we hope to see this type of programming continue to expand throughout the district.